In 2017, 31 percent of the American workforce working remotely grew from 24 percent in 2012. This shift means that managers are increasingly facing the unique challenge of organizing and motivating a team of employees that are spread out across the country and in many cases, the world. The goal as a remote manager is the same as an in-person leader: to effectively and consistently connect and support team members who you don’t see on a daily basis. If you’re struggling to manage your remote team, use these tips to bring everyone together, and boost productivity and unity. Start by implementing a messenger app like Slack to communicate. Emails get lost in the shuffle, and chatting makes it easier to connect quickly, in real-time. Second, set-up a project management tool like Trello, Basecamp or Asana, all of which keep you and your team on the same page about tasks, assignments, progress and budget. Using a project management app, all of this information is kept in one place rather than being spread across a bunch of emails. If you don’t already have a favorite tool, test-drive different apps and compare prices and functionality for remote-work teams. Check out Hubstaff’s in-depth guide of project management tools for remote teams. Hold weekly company-wide calls, giving everyone a chance to tune in, see faces, and connect. Celebrate employees with company-wide calls, not just a private email. Hold Friday lunch “updates” where everyone eats lunch while sharing their biggest accomplishment that week. Professionals are drawn to the flexibility of remote-working opportunities. Employees can set their own hours and fit their job and responsibilities around their life and family. Don’t take away this luxury by micromanaging your employees. Instead, look to build your team with self-motivated, results-driven employees so you don’t even need to. In fact, Remote workers may actually work more than their in-office counterparts. Based on a Gallup study, remote employees record an average of four more hours per week than on-site staff. Reframe your mindset to be product-focused, not time-focused. For example, instead of worrying about how much time your employees put in, focus on whether or not they’re finishing tasks and projects on time. This saves you the stress of constantly checking in, and them the stress of being overly managed when they don’t need to be. If you implement a project management app, you don’t need to micro-manage anyway; one click and you know what everyone is doing. You can even set up weekly reports that are automatically sent at the desired day and time. Read through these reports every Friday to check-in on weekly progress and prepare yourself and your employees for the coming week. In- allows you to address sensitive items, establish trust, and develop personal connections. “My brother, Michael and I believe that we must be present in the flesh. Although we have many video conferences daily, nothing ever replaces the face to face time with team members,” says Ted Rollins, global entrepreneur and business owner. While meeting face-to-face regularly is ideal, it’s not always possible on a tight business budget. If you can’t afford to fly to a new location regularly, implement bi-monthly lunches, where you and 3 to 5 other employees eat lunch “together” via video call, chatting like you normally would in the office. This gives you a chance to connect with employees, and them a chance to chat with their co-workers as well. In such a small group, everyone can get to know one another and build rapport—something that happens naturally in a standard office environment. This is especially helpful for you; knowing what makes your employees tick helps you manage them better. 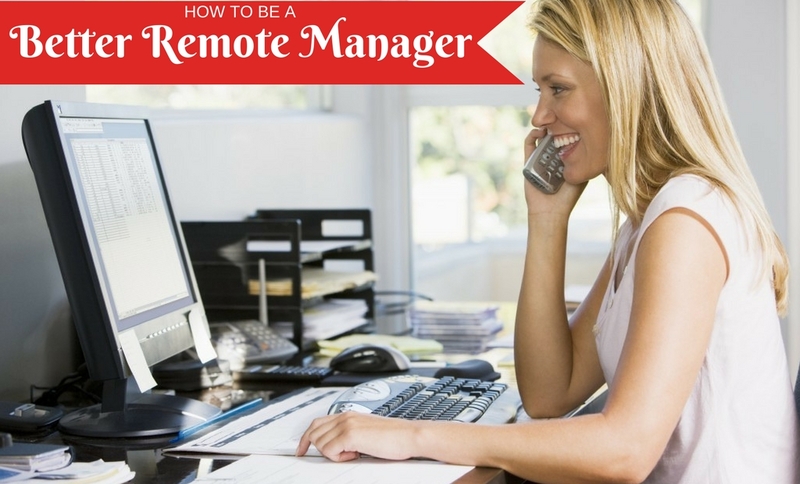 The job of a remote manager is the same as that of a traditional one: connect with and support employees. Use these tips to put in more face-to-face time, get to know the people who are working for you, and drive productivity. When you’re running like a well-oiled machine everyone wins. About Author: This is a Guest Post from Jessica Thiefels. She has been writing for more than 10 years has managed a number of employees in her various roles. She is now self-employed, doing remote content consulting and has been featured on Forbes and Business Insider. She regularly writes for StartupNation, Manta, Glassdoor and more. Follow her on Twitter @Jlsander07 and connect on LinkedIn. Previous articleHow to Build Trust with Employees as a New Boss? Next articleCognitive HR – Where This Technology Impacts The Most?